On the pendulum of taste, chicken salad has two extremes; dry and flavorless, or swimming in enough mayonnaise to make you almost believe that it’s not dry and flavorless. Somewhere in between lies perfection; moist, tender and bursting with flavor chicken salad with just enough mayo to hold everything together. A salad so good that you could eat the whole bowl. Not that I have ever done that, at least not in one sitting. Tarragon: Tarragon is the yin to chicken’s yang. Sweet and with a hint of fennel, tarragon brings out the best in chicken. 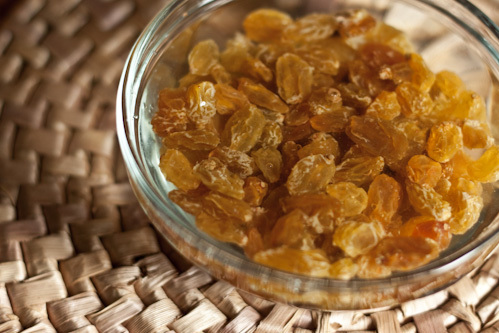 Raisins or dried cranberries: Bring a little sweet and tart to the party with these dried fruit. Chop them up fine so that you get a hint in every bite. If you like more tart than sweet, use the cranberries. The Method: Since one post can’t possibly have too many analogies, lets think of perfectly poached chicken breast as Dr. Jekyll, and dry, overcooked chicken breast as Mr. Hyde. All it takes is a little too much heat to go from the good, to the bad and the ugly. The poaching method in this recipe is my chicken salad’s BFF. Use bone in breast with the skin on, or you might get a visit from Mr. Hyde despite your best efforts. Place chicken in a single layer in a deep skillet or pot and cover completely with water. Bring to a boil over high heat, then reduce heat to medium and simmer for 10 minutes*. Remove the pot from the heat and let the chicken steep for an additional 15 minutes. Let the chicken cool until you can handle it comfortably. Remove the skin and bones, and then cut into half inch pieces, or shred into strips along the grain, similar to pulled pork. 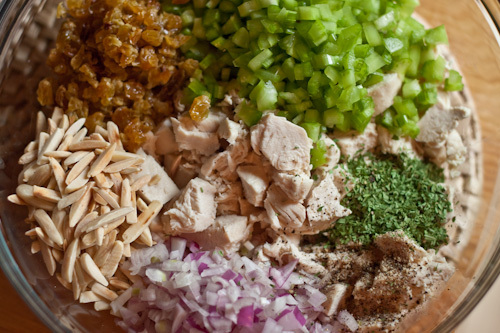 Add the remaining ingredients to a bowl with the cooled chicken and stir to combine. Serve as a salad or as a sandwich filling. *If for some reason you feel the burning need to use boneless skinless chicken breast, reduce the cooking time by about half. Beautiful picture – is that dark pumpernickle? or rye? I love tarragon in my chicken salad. I also add it to my tuna salad. Thanks for the suggestion of raisins – love this recipe. 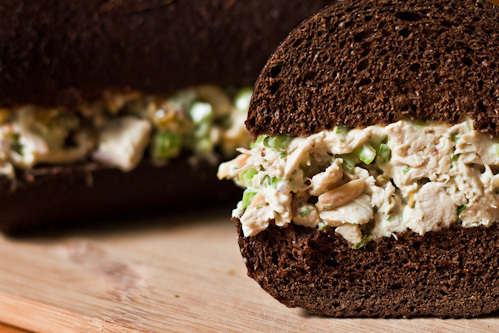 Looks very good, I love chicken salad, and the raisins are a great addition! Lea Ann: It’s dark pumpernickle. Love the stuff. Except maybe with peanut butter, though on second thought, maybe I’ll have to try that! CheapAppetite: I’ve made it with walnuts too, both are great with this salad. 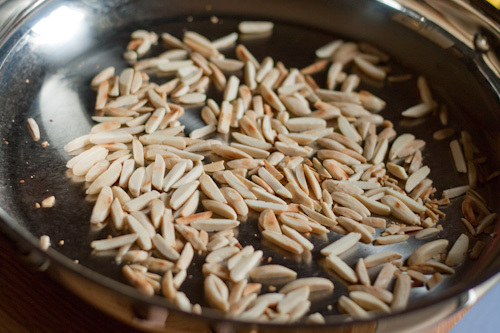 I bet pine nuts would be good too, though they don’t hold their crunch very long in a moist recipe. I absolutely adore chicken salad with tarragon. Great photos! This looks delicious! I had a sample of chicken salad that I loved at a store several months ago, and it seemed very similar to this (but I bet yours is even tastier). I may try to make this with yogurt instead of mayo to see what happens. I love how you used raisins instead of grapes like most recipes call for. I feel like the grapes are too juicy and makes the salad more tart than I like. I usually add in some curry powder as well. YUM! Well, its not just another chicken salad recipe, its your favorite—and it sounds just right with tarragon, toasted almonds and golden raisins. Cookin’ Canuck: Thanks! Tarragon is so great with this salad. I think next year I’d like to plant some in the garden and see what I can do with it fresh! Cookie: Great idea! Curry powder instead of the tarragon would make a great salad, especially with the raisins. Yum! This is just how I like my chicken salad (only I use dried cranberries instead of raisins). I’ve never added tarragon before though – will try that next time – looks delicious ! that first photo has me drooling! that is such a beautiful captivating photo of your chicken salad. Yes, another chicken salad indeed but this one looks particularly good! And congratulation for the picture! your photos are beautiful..no wonder you’re on the daily nine today. This sounds delicious…can’t wait to try it. Your photo is stunning. Congrats on being one of today’s top 9. Shirley: Thank you, and I hope you enjoy! That is one nice looking chicken salad! I am going to have to try adding some nuts to my next one. What a wonderful website! I love all the pictures! I was referred to this website through food buzz. I will visit this blog often. Thanks for sharing your great recipes! I prepared this dish for our dinner last weekend. Everybody loved it, most definitely I’ll be serving it regularly now, it certainly is lovely to uncover innovative tips for tasty recipes and easy to understand approaches to make them. Thanks for providing some. I really love the pictures you had taken.It is really sharp and nice.